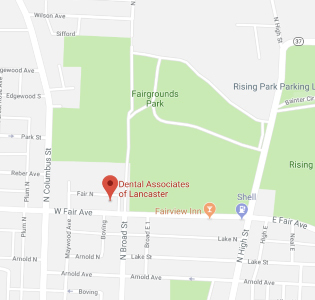 From routine cleanings and fillings to cosmetic and implant dentistry, Dental Associates of Lancaster is equipped to handle all of your dental needs. To help you understand your options, we've included descriptions of some of our leading services. Your first visit at our office is very important in establishing your oral health baseline. Dr. Decker, Dr. Johnson, or Dr. Wilkinson will perform a complete oral examination which includes an oral cancer screening, periodontal evaluation, an analysis of your occlusion (bite) and a thorough examination of your teeth, their supporting structures and of the oral anatomy. All patients should have a standard cleaning at least twice a year. A child should have a prophy and fluoride treatment twice a year. A cleaning on an adult might include an adult prophy (basic cleaning), and/or a periodontal scaling and root planning. Our state-of-the-art bleaching system will make your teeth whiter and brighter. The terms dental crowns and caps are synonymous. Crowns are typically used to restore a tooth's function and appearance following a restorative procedure such as a root canal. When decay in a tooth has become so advanced that large portions of the tooth must be removed, crowns are often used to restore the tooth. Crowns are fabricated in a laboratory and are made either of porcelain baked onto a metal substrate, all-porcelain, or many of the new ceramic materials that have been developed. Root canal therapy is needed when the nerve of a tooth is affected by decay or infection. This simple treatment can save your natural teeth and prevent the need of dental implants or bridges. Symptoms of the infection are generally acute dental pain or sensitivity to hot, cold or percussion. If you experience any of these symptoms, Dr. Decker, Dr. Johnson, or Dr. Wilkinson will most likely recommend root canal therapy to eliminate the diseased pulp. This injured pulp is removed and the root canal system is thoroughly cleaned and sealed. This therapy usually involves local anesthesia and may be completed in one or more visits depending on the treatment required. Success for this type of treatment occurs in about 90% of cases. If a tooth is extracted or missing it is now possible to replace it using dental implants. An implant is a new tooth made of metal and porcelain that looks just like your natural tooth. It's composed of two main parts: One part is the titanium implant body that takes the place of the missing root, and the second part is the tooth-colored crown that is cemented on top of the implant. In addition to tooth replacement, implants may be used to anchor dentures, especially lower dentures that tend to shift when you talk or chew. For patients with removable partial dentures, implants can replace missing teeth so that you have a more natural-looking smile.